[Jesus said,] "Remain in me, and I will remain in you. For a branch cannot produce fruit if it is severed from the vine, and you cannot be fruitful unless you remain in me. Yes, I am the vine; you are the branches. 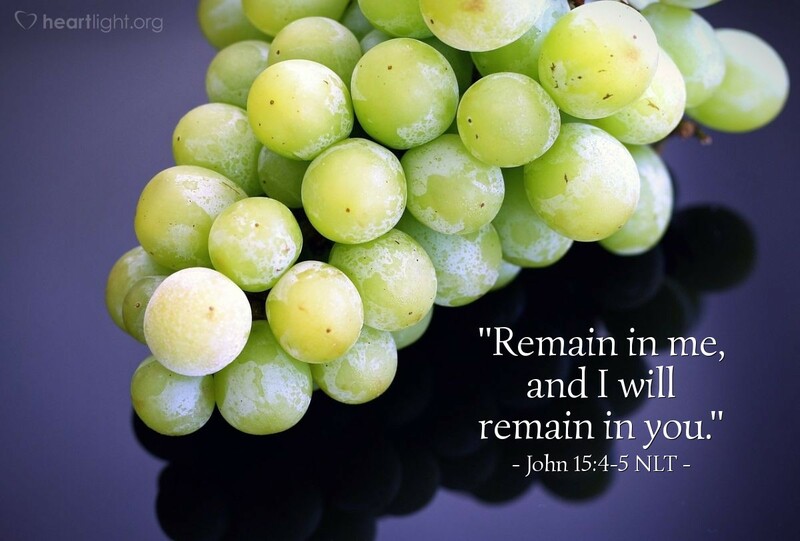 Those who remain in me, and I in them, will produce much fruit. For apart from me you can do nothing." The key to fruitfulness is not effort, though effort will be necessary. The key to fruitfulness is not circumstance, though how we handle our circumstances is important. The key to fruitfulness is not our personal strength, charisma, or wisdom, though each of these abilities will be given to us to help make us more fruitful. The key to fruitfulness is for us to have our lives joined to the one, true, healthy vine — Jesus. As our lives are joined to his, as we "remain" in him and he in us, then fruitfulness happens naturally. As branches, we derive our health and productivity from the vine. Want to live productively for God? Then let your life be joined to Jesus! Invite him in to remain in you as you draw close to remain in him. Holy God, draw my life closer to Jesus. Mold me and make me to be more like him. Use me to bring you glory and to help others know about your grace in Jesus. Fashion your character in me and use me to bless others. Lord Jesus, as I pray in your name, please come and live in me. You are welcome in my heart. I seek your presence and your power in all that I do. Amen.